As the Temple men’s basketball team made its surprising run to the NCAA Tournament last month, thoughts raced through Andrew “Scootie” Randall’s head. R andall, a 6-foot-6, 200-pound forward who led Communications Tech High School to a Public League Championship in February, has verbally committed to play for the Owls next season. Along with fellow Temple recruit, 6-3 guard T.J. DiLeo of Cinnaminson High School in New Jersey, Randall can officially join the Owls roster tomorrow, the first day National Letters of Intent can be signed. Randall, the recipient of both the Public League and PIAA Class AAA Player of the Year awards, after averaging 21.2 points per game as a senior, has kept busy of late. He scored 21 points and pulled down six rebounds at the All Star Labor Classic at Saint Joesph’s Alumni Memorial Fieldhouse Sunday. Earlier in the week, Randall participated in two games in the Albert C. D’Onofrio Classic, a single-elimination tournament held in Conshohocken. What do these post-season exhibitions mean to Randall? “It means just coming out here and working on what I need to work on to be better at the next level,” he said. Randall got a glimpse of what the next level looks like when he scored 16 points to lead Communications Tech over Frankford, 77-73, in double overtime of the Public League title game, which was held at the Liacouras Center, on Feb. 24. The three-year-old Southwest Philadelphia school lost to Simon Gratz in the Public League title game in 2006 and fell in the AAA final in 2007. Although Randall led his team in scoring, he seems to prefer allowing the game to come to him on the offensive end, rather then taking over a contest by himself. 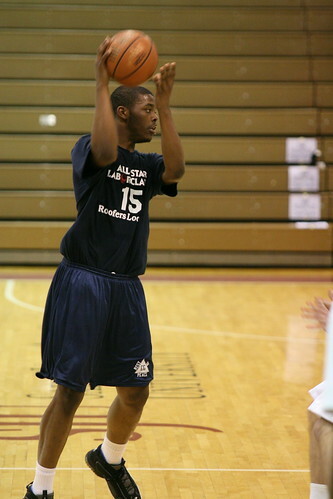 At the All-Star Labor Classic, Randall got the chance to bring the ball up the court several times and play facilitator, setting up his teammates for shots. It’s an aspect of his game he’s focused on improving, he said, noting that he wants to strengthen his “basketball awareness” and his ball-handling skills during the offseason. In terms of what he can bring to the Owls, Randall said he hopes his passing and rebounding abilities can supplement the team’s needs, especially with Senior guard Mark Tyndale, one of the better all-around players on the squad, who is graduating. Randall said he recognized that Tyndale filled a lot of different holes for the Owls and that’s why he’s working on improving his overall repertoire, including his ball handling. “Since Mark Tyndale left … A lot of people can bring the ball up but I’m just hoping I can go in there and show the best of my abilities and be able to be on the floor next year,” he said. Like Randall, Temple sophomore guard Ryan Brooks also played in the All-Star Labor Classic in 2006. Last year’s game featured freshmen forward Lavoy Allen, guard Ramone Moore and center Michael Eric, who sat out last season after he was deemed academically ineligible. Academics might play a major factor in just how soon Randall can log minutes for the Owls. Alongside coach Fran Dunphy, Randall is working to ensure that he can qualify for freshman eligibility next season.